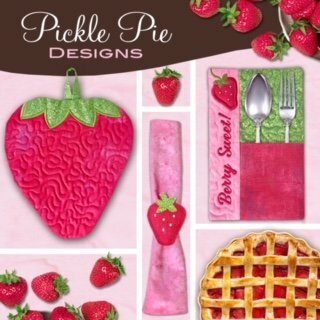 Call 919-469-4730 to save your seat at this event with Pickle Pie Designs Creative Director and Machine embroidery expert, Lisa Archer! Deb will finally be with us and "She is amazzzzzzzing". Come and see her serge. You do not want to miss this one day opportunity to visit with a true artist. Debs creativity on the serger will blow you away. You will learn so much about settings, fabrics, tools, threads and techniques. 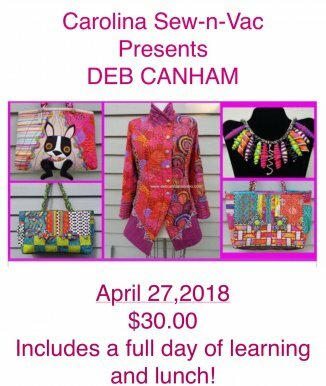 Debs incredible skill combined with her true joy of teaching will inspire you to serge up crafts, clothing, jewelry, home decor and more. A fabulous teacher with a mind blowing trunk show to share. Space is very limited so call now to register.